While the lottery odds are weighted such that the teams with the worst records are more likely to win one of the coveted top three spots, anything can happen, and once the balls drop and the top three are selected, the rest of the front half of the first round will play out according to record, going worst to best. 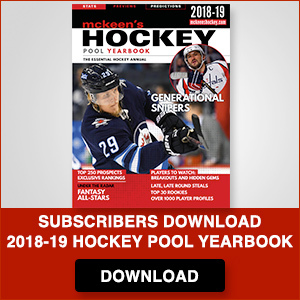 The Ottawa Senators, who traded a first-round pick in either the 2018 or 2019 draft as part of the package to acquire Matt Duchene from Colorado in 2017, decided to keep the fourth overall pick last year to select Brady Tkachuk, gambling that their draft selection this season would not be better. It could have been as they actually finished the regular season with the worst record in hockey. Thankfully for Pierre Dorion’s blood pressure and job security, they “lost” the lottery, and moved down four spots. The fact that they lost the Duchene trade is already written in stone, but at least with the fall of the lottery balls today, they didn’t lose twice and give away the first choice in the draft. Without further ado, let’s take an early look at how the top 15 of the 2019 draft could play out, presuming that all teams keep their current picks, and knowing what we know about the talent available come June in Vancouver. Not as bad as the Oilers winning, it is hard to feel too much neutral pleasure in New Jersey coming away with the first pick, after all, they also won the draft lottery in 2017, drafting Nico Hischier. Their roster also has former first overall pick Taylor Hall. With Hughes in tow, the team will thus have three former top picks, all with last names starting with “H.” The marketing possibilities are endless. Hughes will step right into the lineup, and with reasonable depth down the middle (Hischier, Travis Zajac, Pavel Zacha, Blake Coleman, etc) the Devils will be able to protect him to start until he proves ready for heavier minutes. The top two centers on the NHL depth chart, Jonathan Toews and Dylan Strome, were both former third overall draft picks. With Hughes and Kappo expected to be off the board at 3rd overall, the Hawks can make it three for three. The organization has been beefing up the blueline pipeline fairly extensively over the past few drafts and Dach has some Toews like elements to his game that should make him a complementary contributor to their two-way game as soon as this year and not later than 2020-21. Bowen Byram. 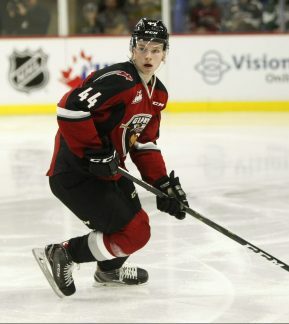 Photo by Chris Relke/Vancouver Giants. You may be thinking that we are just running down the most recent McKeens draft rankings and that is how things are playing out so far, but this decision was made easier in light of the struggles Conor Timmins has had in getting on the ice. The Avalanche have one stud waiting to join the NHL blueline in Cale Makar, a finalist for the Hobey Baker Award, and Byram can develop into his future partner, giving the Avalanche a young pair in the back that could rival the likes of Columbus (Seth Jones and Zach Werenski) or Nashville (pick ‘em). Alternately, they can separate the two and have two blueline pairings with high end offensive capabilities. See, I told you I wasn’t just running down the draft rankings. The Kings have struggled to bring in impactful Russian talent through the draft and those they bring in have disappointed, some on the ice (Kovalchuk) and some off (Voynov). With the back injury that has kept former first rounder Gabriel Vilardi from making his NHL debut, Cozens could have the chance to make a quick impact in LA, although the team is unlikely to rush the man-child who blends an enticing mixture of skating ability, puck skills and a refined hockey IQ. 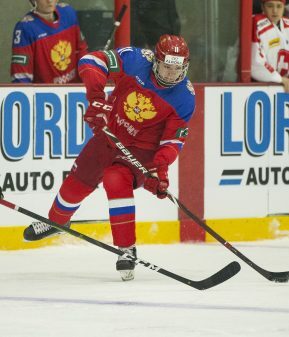 Russia forward Vasily Podkolzin (11) in action during the U20 ice hockey game between Russia and Switzerland on December 23, 2018 in Burnaby. For the second year in a row, the Red Wings get the sixth pick. Once again, they take a supremely talented winger. After drafting Filip Zadina last year, when many had him going in the top three, Podkolzin was also long thought of as the third stringer to Hughes and Kappo in this year’s draft. Part of the reason for Podkolzin “falling” here is the expectation that he will stay in Russia for a while longer. For an organization that has a reputation for letting players slow cook in their development, that might not be a bad thing. Podkolzin is raw, but his talent is high end and he also shows signs of two-way potential. What do you get for the team that needs everything? How about a winger with NHL tools and a big shot who can capitalize on the chances afforded by McDavid’s wheels or Draisaitl’s big presence? Boldy could be a touch more consistent, but to his credit, his temporary malaises were less frequent than recent USNTDP snipers like Oliver Wahlstrom or Kieffer Bellows. He also shows more effort off the puck and special teams utility. In other words, he can contribute to his team even when he is not scoring. A right-shot defender who is already performing regularly with the men in the SHL, Soderstrom fits with the Ducks’ draft habits, both positionally, and geographically, as they tap Sweden early and often. Soderstrom is fast and skilled, but his hockey IQ is his calling card. He could rise relatively quickly to the NHL. 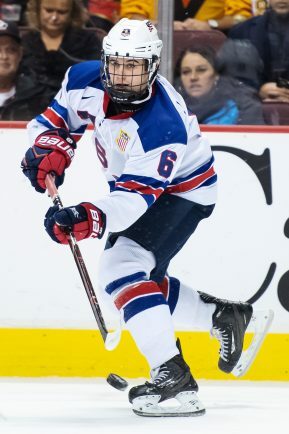 With Quinn Hughes already giving the Vancouver faithful a taste of what he can do, and other USNTDP graduates in the system besides, the Canucks should not hesitate in drafting another USNTDP alumnus and Turcotte would go a long way to adding depth and breadth to the team’s offensive attack after a year or two at Wisconsin. On skill set alone, Turcotte could easily be picked as early as sixth, but a year punctuated by multiple injuries may cause him to tumble briefly. The Canucks will benefit. The Flyers drafted a pair of forwards in the first round last year and two in the first round in 2017. While their 2015 and 2016 first rounders were used successfully on the blueline (Travis Sanheim and Ivan Provorov) GM Chuck Fletcher should feel the need to replenish the backline now and York offers a gifted puck mover with fantastic vision and passing skills who they could allow to develop at his own pace at Michigan. 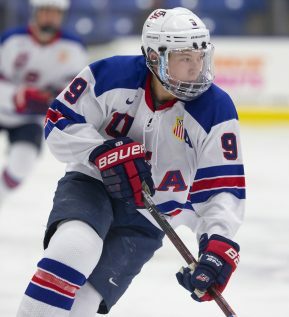 Having made two selections last year from the USNTDP – and giving one of them, Joel Farabee, an ELC after only one year of college – indicates that the Flyers appreciate the pro-readiness of players out of the hothouse American program. 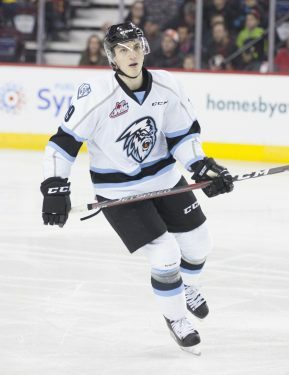 A beautiful skater with fantastic puck distribution skills, it was easy to overlook Krebs playing with the perennially downtrodden Kootenay franchise in the WHL. With the Ice moving to Winnipeg, it would be fitting for Krebs to be drafted by a team just to the south in the Twin Cities. The Wild prospect cupboard is fairly barren, and Krebs would add a highly coveted top six center with a long list of plaudits for his leadership capacity. Will be even better once he gets to play with skilled linemates regularly. While the Panthers would have loved for Krebs to get past Minnesota, they will have a hard time passing up on the high scoring Newhook, who has been laying waste to the BCHL for the past two seasons, leading the league in scoring in his draft year. There is some concern that he has been feasting on minnows and struggling against more advanced competition (see his performance at the 2019 WJAC), but he will have one more chance to put that particular criticism to rest as he represents Canada at the upcoming WU18 tournament. If he develops as expected, he could give the Panthers a fearsome foursome down the middle, along with Alexsander Barkov, Vincent Trocheck, and Henrik Borgstrom. Caufield to the Coyotes feels right. The desert organization has dipped into the USNTDP ranks repeatedly during the Chayka regime and often to great success (see Keller, Clayton and Fischer, Christian). All Caufield does is score and the Coyotes need players who can do that. (Who doesn’t?) He is small, but that may be the only knock on him that cannot be refuted. Thankfully, he is stocky and shifty and knows how to find little gaps in coverage and strike with only the smallest of openings. The Alex DeBrincat comparisons are on point. The Canadiens have plenty of depth up front in the system, including at least three young centers with clear top six potential in Jesperi Kotkaniemi, Ryan Poehling, and Nick Suzuki. The Habs’ system also has a lot of nice young blueliners, but few, if any, who clearly have realistic top pairing projections. Broberg is not a prototypical new-age puck mover, but he is an elite skater, reads the game very well and knows how to put his NHL-sized frame to good use. More Mattias Ekholm than Erik Karlsson and he would instantly become the highest end defenseman in the Montreal system.